Remember the Anchorage Music Scene? 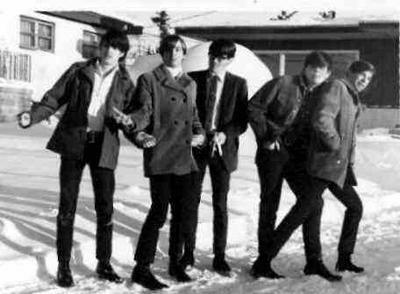 Do you remember some of the bands that made up the Anchorage, Alaska music scene back in the 1960's to 1970's? The band in the picture above is the Blue Chip Stock. Their keyboard player, Skip Conte, also played for Anchorage's Pulsating Heartbeats, and went on to play for Three Dog Night and the Blues Image and co-write their hit song, "Ride Captain Ride. Other Anchorage rock bands included the Arsons, the Outlaws, the Pulsating Heartbeats and Mother's Apple Pie and Baseball Band. When I worked at KTVA channel 11 in Anchorage, a KBYR DJ by the name of Bruce Kier brought in Johnny Collinsworth from the Buckaroo Club to do a 1/2 hour weekly show that we produced during the week and aired on Saturday nights called "Johnny Collinsworth and the Country Capers Country Music Variety Show". My brother Tom Dougherty and I directed the shows. Guests included Nancy Lee and a fiddle player named Shorty Ladd. The band was excellent and the show was very creative. KTVA also did another show called "Country City Music Time" and we shot the weekly show on location at Country City on the Seward Highway. While at KYES channel 5, we did a weekly show with a country singer named Sonny Day. His steel guitar player's day job was Chief Engineer for KTVA. The Pines Club was another popular venue for local music and well known entertainers as well. A fellow by the name of Doug Hager became a local Anchorage, Alaska legend as Mr. White Keys. I first met Mr. White Keys when KAKM channel 7 had him host a series of local radio DJ stories for the weekly Anchorage TV magazine show, "Southcentral". Mr. Whitekeys, aka, "W. Keys" and his band played regularly at Chilkoot Charlies, where they "cheat the other guy and pass the savings on to you". Later, Mr. White Keys opened his own place in Spenard, the Fly-by-Night Club, where his band was known as Mr. White Keys and the Fabulous Spamtones. At the club, if you ordered spam, you got a free glass of champaign. Later, Mr. White Keys put together the "Whale Fat Follies" and the rest is Anchorage, and Spenard history. The place to go for live music for Anchorage teens, were a number of teen night clubs put together by local DJ Ron Moore (the Royal Coachman) and Pacesetters. Some of the bands included the Arsons, the Chandels, G Morgan S and the Jets, the Gatormen, the Pulsating Heartbeats, the Johnson Brothers, the Nomads, the Outlaws, Proof, the Prophets and the Quarrymen to name a few. Do you remember the Royal Pad, Cinnamon Cinder and of course the Cheetah on Government hill. There were also weekly teen dances featuring live music at Shindig City, a Mountainview roller rink, the national guard armory and the old Sports Arena on Fireweed. Of course this is just the tip of the iceberg. Comments for Remember the Anchorage Music Scene? My father told me he was the drummer in a band called Skull. He was in the army, stationed in Anchorage. He told me he opened for BTO. Anyone familiar with any of this? I forgot to mention that 'A Burgundy Rose' was the Alaska state "King of the Bands", in 1968 and 1969. I loved doing my tribute to Elvis shows in Anchorage. Especially at the Pines Club! I was there several months. I was treated great by the Pace Family! The fans were very loyal we had a packed house every night. I regret I never came back to Anchorage. I wrote a song called "Joneen" there after one of Russ Pace's daughters. I just loved that name. Took me just 15 minutes to write. I still sing having 3 top 10 records now and 1 gold. Only I sing under Robert Fisher. Miss everyone there. Love Anchorage and the great people. I about fell off the chair when I saw the comment by Mike Deaton. I played with him when we were with Susan Rhodes. I met his parents some time after he left Alaska when I did a TV service call at their house. I played in/around Anchorage from 1969 to 1975. many bands/locations. 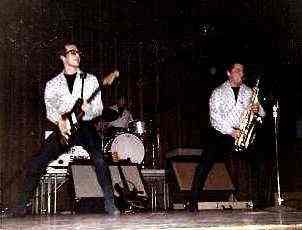 One band that was well known was "Bomax" We did all the usual gigs from Carpenter's Hall to the sports arena on Fireweed. Others I played with were Dan Green (guitar), Jose Benitez (piano), Larry Waldron (killed by a bear at McHugh Creek). Larry was one of the most imaginative and original writers I ever met. When he ripped into a guitar solo it gave me a charge and it really lifted up my bass playing. He also doubled on sax and he was killer there. He went on to teach and play in Anchorage for a long time. I remember his funeral. It was huge! But one thing I still remember. He went to Berklee College of Music and when he came back it seemed he had lost his edge and more importantly his originality. Still accomplished but not the same before he left. Larry's girlfriend also played on piano and trumpet but I cannot recall her name. We had a couple of drummers. Both stationed at Ft. Rich. First was Greg Nutt from Hawaii. He had played with Don Ho there and was a showy drummer. Second drummer was Mike Nepo. He was from the Atlanta area and had played on the studio recording of Lou Christie's "Lightnin' Strikes" which hit No#1 on Billboard's top 100. Both great drummers. We played in both a six piece with horns and in a power trio format. I really enjoyed the power trio stuff. One of the best concerts we played was as warmup to the Guess Who at the Sports Area on Fireweed. The PA was awesome.It was about a third of the PA used by the Rolling Stones and Ten Years After on their Orient tour. They dropped it off in Anchorage on the way back from that tour. It was from a PA company called Tychobrae. That was the big outfit that did the famous California Jam. There were a LOT of great concerts at that old Sports Arena. I must have played with 100 different musicians during my time. And at 100 places. I will get together a list someday. I know in Spenard I can see at least 3 places I played in each block between Northern Lights Blvd. and Minnesota Drive. Some under two or three different names and ownerships. Lots of memories there. I know I am forgetting a bunch right now but I will try to post more of the musicians and places as I get a chance. I went back to Anchorage in 2000/2001, first to see my family and then to play at the 2001 celebration with Dave Cuddy, Jim Martin and a bunch of us old rockers. We played a concert at the downtown (I think it was the Arts Center?). I put a letter in the paper and it grew into an amazing reunion of old friends and musicians from Anchorage's 'Golden Age of Rock n Roll'. Wikipedia says that music in Anchorage didn't begin until the '80's, they got it wrong. I replaced a kid that was leaving with his Air Force family, who knew me from the Elmendorf Teen Club. Jim Martin, Mike Howe,Spike Poulin, Tim,(now Val) Rader and myself played together for 3 years or so. Tim left for College,I believe in'69 and Mark Ritter came on board. Kay Hildebrand and her husband were our managers. We were the Anchorage "King of the Bands" a couple of times and in '69, went to N. Carolina(in August, another story) and came in fifth! We were the only rock band there, all the other bands were Vegas type shows, with at least a dozen people on stage( a precursor to Madonna and Beyonce). We were amazed when we got through the first round and blown away by our placement. We also blew up some stage amps while playing. Oops. I put the two drum sets together and tried to play double basses. Told people we did, indeed live in igloos and ran an extension cord up from Seattle. We opened for a bunch of 'big name' bands and played at the 'Sears Look-In Fashion Show', broadcast over the actual public radio, I got a recording. A 'big deal' 50 years ago. I was the 'Band Room Magistrate' at The Cheetah while it ran, and saved it from a fire once (again, another story). I also played with Proof, Tyme, Albatross(Anchorage "King of the Bands"in'70)The Entire Turkish Army and,later ('74), the Susan Rhodes Show. Another band I remember was Captain Soul's Sound Circus(great name). also the Blue Chip Stock. Thank you for your very informative post about your involvement in the Anchorage music scene. I'm sure our readers will remember many of the names and bands you mentioned. Regarding the photo on the right at top, The Pulsating Heartbeats. Does anyone know is that one (or both) of the Apostol brothers, who later had their own band? I remember them playing at Wendler Jr. High dances once or twice in the early 70's, and thinking they were the greatest. I have been friends with Rafael (John) of the Heartbeats since our days at Clark Junior High. Unfortunately, Rafael's two brothers, Eddie and Raul, who were both in the Heartbeats, passed away some years ago. Since then I do know that Rafael was playing in another band for a time. 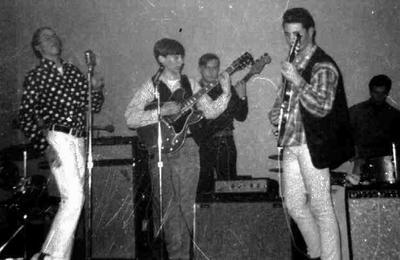 ‘60’s Local Bands - "The Affairs"
I played in a high school band from ‘65-‘67 called the Affairs with Bill Heisler, Temp Campbell, Tommy Chance, and Tommy Moffat. We played a few times in Anchorage but mostly Eagle River, Palmer, and Wasilla, Alaska. We remember the Blue Chip Stock, Checkerboard Blues, HeartBeats, and many others mentioned above. Those were fun times! I am still teaching guitar in Eagle River. Pay it forward to the next generation! I remember those days with great fondness. What a great place for teenagers with the Cinnamon Cinder and Pacesetter's Shindig City. I had moved up in 1965 and a year later was playing twice or more every weekend and having a ball. Playing for the Arsons and Mother's Apple Pie and Baseball Band was so much fun. We got to open for all the great acts that came to town. I especially remember opening for Sam the Sham, Charles Lloyd, Rick Nelson's Stone Canyon Band (Rick was a wonderful gentleman) and the Turtles both in Anchorage and at the Alaskan Centennial Exposition in Fairbanks. After I did a hitch in the Air Force where I was stationed at Elmendorf AFB, I joined Proof with Gary Sloan, Ted Luther, Curtis Cunningham and Spike Poulan. That's when I met Mr. Whitekeys when we both played at a lounge near Lake Spenard (The Fly by Night Club). I've recently communicated with Mike Caporale (drummer for Proof and Mother's Apple Pie and Baseball Band) and Dave Cannon (guitar in the Arsons and Mother's Apple Pie and Baseball Band). Mike is a screen writer, director and man of many talents. He just wrote a book called "The Best of Times" with a large section about those glory days. Dave Cannon is a retired lawyer living in Nashville. I actually went from playing for The Arsons to becoming a Firefighter/EMT in Kent, Washington. I married Karyne Brannon and we are both retired and living in Edmonds, Wa. John Lee of the Breakers and Proof fame lives near me and were still great friends. He's still playing in a local blues band called "The Seattle Houserockers" and has CD's available. Mark - thank you for commenting on our story about Anchorage bands. You were certainly a very important part of the Anchorage music scene and it's great to learn about some of the other musicians who were also such a huge part of our lives in Anchorage "back in the day"
As a member of Hydra back then, thanks for the mention. Hydra was local. Kenny and Dave Gundacker were brothers and went to West High. Their sister Donna was my best friend since I was 13 and I knew them growing up. Dave was on guitar and wrote songs. Kenny was lead vocals. They played Monkey Wharf quite a bit too, in the early 80s. They got a record deal but then Kenny passed away. Dave is still rockin out in a band In California, and is on Facebook. I had the pleasure of singing and preforming with Johnny Collensworth, Shorty Ladd, Jim Zusou (sp? ), and others. We did some Muscular Dystrophy Telethons driving around and singing at different gigs all day until the bars closed, ending up at Tips in Eagle River. There was a recording studio in the basement of the old Country City where we recorded. Mr. Whitekeys come down a few times to visit and talk to Johnny. History said the place was haunted. Also cut a song with Kenny Blackwell. And did guest spots at Mt. Alyeska in the original lodge. Danced my heart out at the old Pines, and was offered the lead singing position there after Nancy moved on. But I had a good job and was raising two kids so I declined. I have great memories of hanging out with the Johnson Brothers. I dated Steve for awhile and my girlfriend dated Pete. They were both great guys. Would love to know what ever happened to them. Lost contact after I married and moved to California. Yes Hydra was in Anchorage band, they play at Chilcoot's, and opened for a few bands. They played in early 80s. One of their songs made it onto an album that was strictly rock bands of Anchorage. Can't remember the name of the album, but I do have it put away somewhere. They were very very good band. They got a record deal in California. Then Kenny past away. Thank you for the update Teena. We are sorry to learn of the passing of your friend. The Country Western performers Johnny Collinsworth, Nancy Lee, and Little Shorty, the Hunch Back, use to play at the Montana Club. The Alaska'n Hill Billy Band, along with Dewy, ha ha Allen,and Drummer Lonnie. Nancy only played every so often. I had a very good friend who started a band right out of high school. They did pretty well. Till tragedy struck in California. Kenny Gundacker was a very close friend his band was Hydra. What ever happened to the band Burgundy Rose? I remember them winning a national contest- battle of the bands I think. They usually played up at the teen club on Government Hill. Late 1960's early 1970's? It was a curling club later. I think. Linda: Perhaps a site visitor can answer your question about the band Burgundy Rose. The teen club on Government Hill was called the Cheetah.